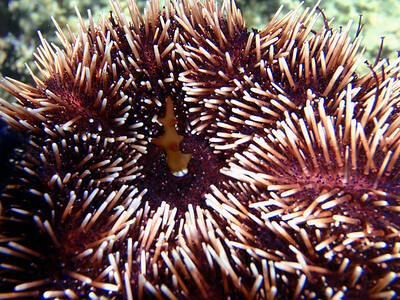 The use of native collector urchins to manage invasive seaweed on a patch reef in Kaneohe Bay: a project of the Department of Land and Natural Resources Division of Aquatic Resources (DLNR press release, 17 August 2010) Official press release: http://hawaii.gov/dlnr/chair/pio/nr/2010/NR10-105.pdf At the start of this experiment, the patch reef was cleared of invasive seaweed using the Supersucker. 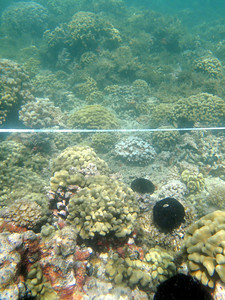 Native collector urchins were then placed on half of the patch reef, while the other half of the reef was left alone. Although these sea urchins are present in a number of habitats statewide, they are largely absent from the bay. Divers periodically moved the sea urchins back to their half of the reef, as no physical barriers were used to divide the patch reef. 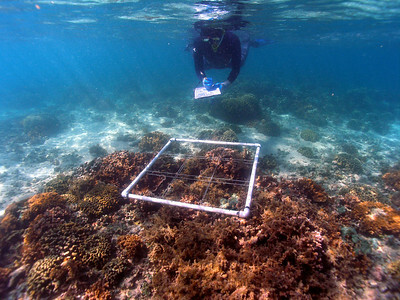 The reef was monitored monthly and the percent of invasive algae was estimated. The urchins grazed the invasive algae throughout the one year experiment and have kept algal coverage to a minimum. 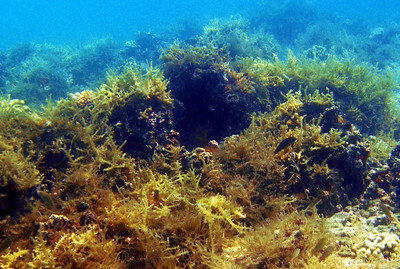 On the urchin-free side of the patch reef, invasive seaweed coverage returned to pre-Supersucker levels within six months. The next part of this experiment will be to move the sea urchins to the non-urchin side of the patch reef. This time, the Supersucker will not be used to clear the seaweed first. The team will monitor how well the urchins do without first removing thousands of pounds of seaweed, and will also document how quickly the invasive algae rebounds on the side that had been grazed for the past year. 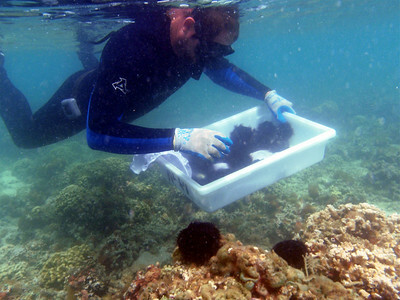 Department of Land and Natural Resources Division of Aquatic Resources diver placing native collector sea urchins on a patch reef to study the effect of sea urchin grazing on algae abundance. Department of Land and Natural Resources Division of Aquatic Resources diver measuring coral and invasive algae cover on a patch reef in Kaneohe Bay. Invasive species is checked for native species before being bagged. Native species are rarely found inhabiting the seaweed, but those that are found are returned to the reef. 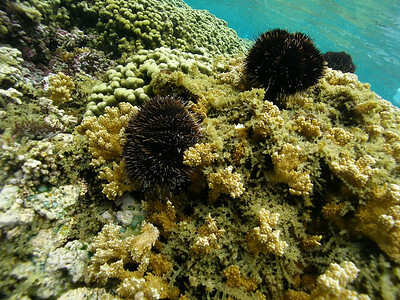 Native collector sea urchins grazing on invasive algae in Kaneohe Bay. 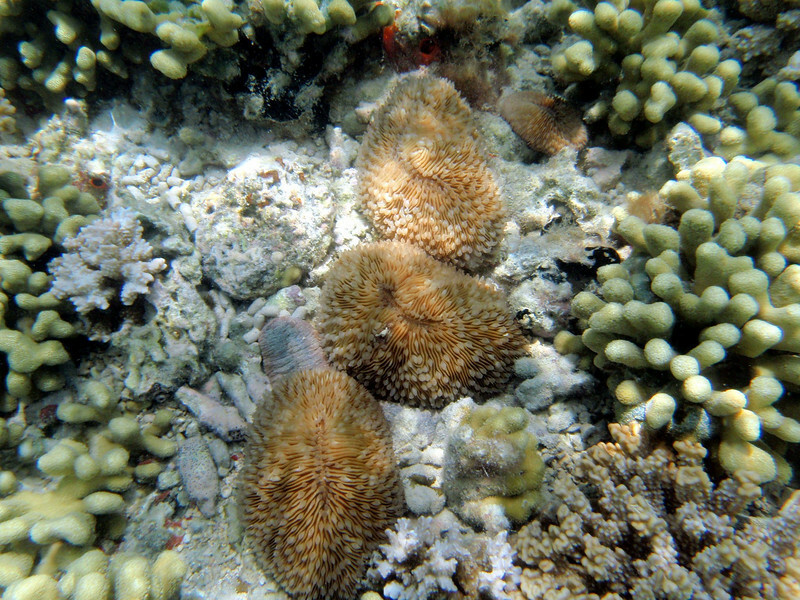 This study showed that by augmenting the native urchin population, the Kappaphycus is effectively managed and the reef was kept clear of the smothering growth. 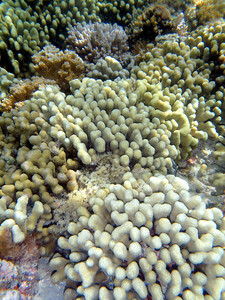 Rice coral in Kaneohe Bay partly covered in the invasive algae Kappaphycus. 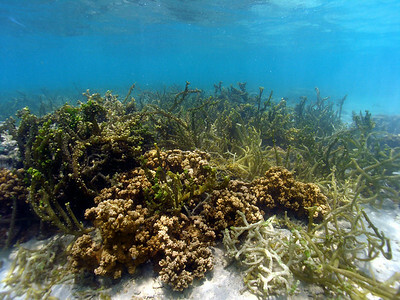 Invasive algae grows faster than coral. 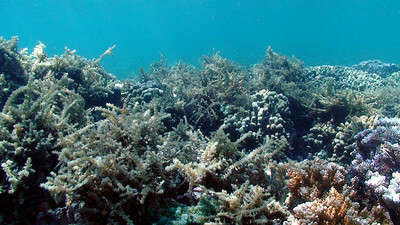 Its thick growth can block sunlight, smother and kill coral, which also reduces habitat for other reef dwellers. Coral reef in Kaneohe Bay partly covered in the invasive algae Kappaphycus. 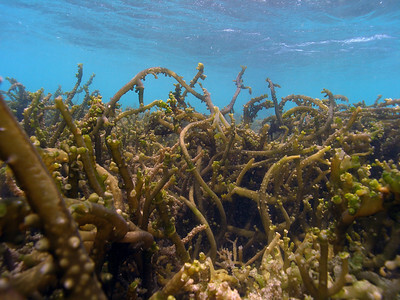 Invasive algae grows faster than coral. Its thick growth can block sunlight, smother, and kill coral, which also reduces habitat for other reef dwellers. Sea urchin actively eating algae. Algae fragment is in the sea urchins mouth. 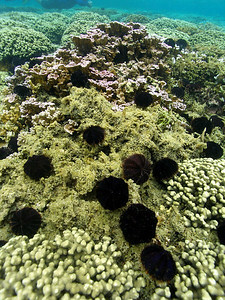 Corals on a patch reef in Kaneohe Bay are kept clear of invasive algae by native sea urchins that have been placed there to graze the algae. 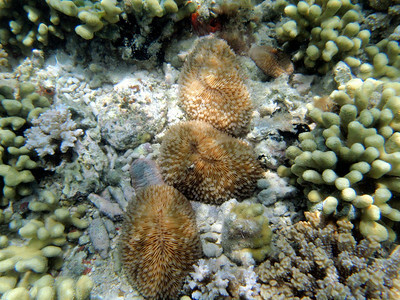 Native collector urchins placed on the patch reef were kept to half of the reef where they grazed invasive algae. 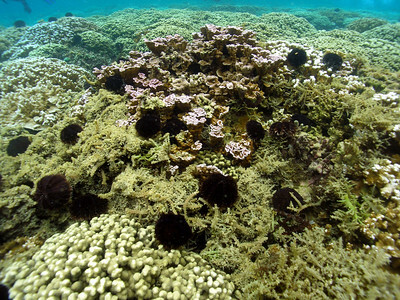 On the half of the reef without sea urchins, invasive algae proliferated. 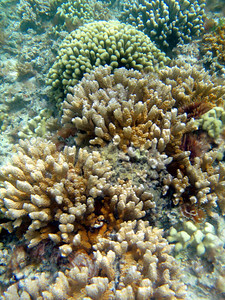 Rice coral and finger coral reef in Kaneohe Bay partly covered in the invasive algae Kappaphycus. 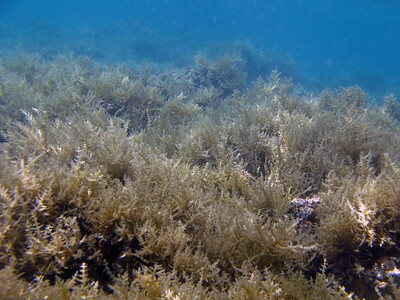 Invasive algae grows faster than coral. Its thick growth can block sunlight, smother, and kill coral, which also reduces habitat for other reef dwellers. 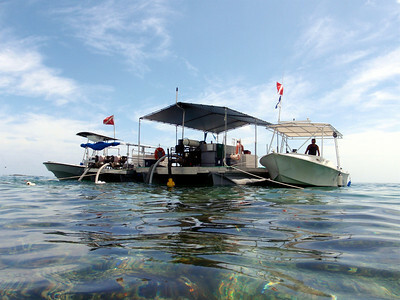 Two Supersucker barges removing invasive algae from a patch reef in Kaneohe Bay. 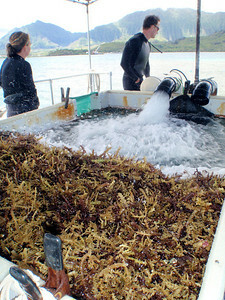 Divers guide the Supersucker hose to vacuum the seaweed, which is deposited on a sorting table prior to bagging. 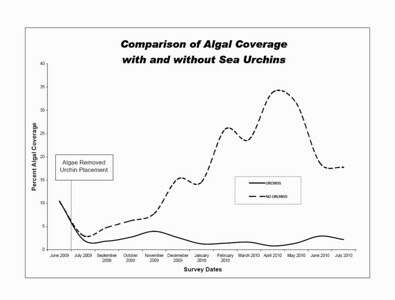 A graph showing the effect of sea urchins on algae abundance over a one year time period.